YUMMY! I love everything pumpkin! Of course I can’t eat or drink everything, but I can try! 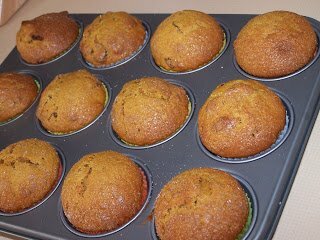 😉 LOL Here’s a fantastic Low Fat Pumpkin Muffin Recipe! Preheat oven to 400°F. Spray 12 2-1/2 inch muffin cups with nonstick cooking spray. Combine pumpkin, bran cereal, skim milk, corn syrup, and egg whites (next 4 ingredients) in a bowl. Combine remaining ingredients in another bowl. Add pumpkin mixture and stir until well blended. Spoon into prepared muffin cups. Bake 20 minutes at 400°F or until toothpick inserted in center comes out clean. Cool in pan 5 minutes. Remove and cool on wire rack.